For families who want the exclusive use of a malaria-free safari lodge and game reserve, Jembisa can accommodate up to 14 people in style with a myriad of exciting activities. Dreaming of an exclusive African holiday? This Limpopo safari lodge in South Africa is in a malaria-free game reserve. Guests have the reserve and lodge all to themselves, it is fully staffed and visitors will be delighted with the attentive service and activities available. With easy access from Johannesburg by road or air, Jembisa, a Limpopo safari lodge in South Africa, has been a family home and now gives guests a relaxed and supremely comfortable space with some extra features such as a library, games room and tennis court. There is a salt water pool which can be heated in the cooler months. There are 5 beautifully appointed en-suite bedrooms and a children's bunk room. Children of all ages are welcome at Jembisa, with plenty of interesting and exciting tailor-made safari activities that are arranged for them. If required, the lodge can provide children's menus and earlier mealtimes. Jembisa is a year round destination. 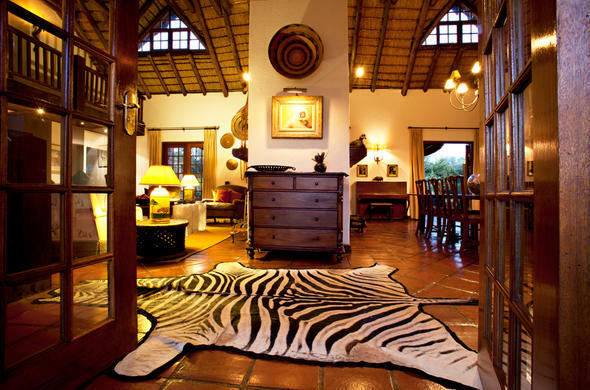 Guests have sole use of the lodge and game reserve, with attentive staff to see to everything. The cuisine is excellent and fresh produce comes from the organic kitchen garden. This safari lodge in Limpopo is ideal for small groups, special occasions and bush weddings for up to 40 people. The Waterberg is a plateau and a designated UNESCO Biosphere. This area is very scenic with rivers, cliffs, ravines, woodlands and savannah. The diverse wilderness is rich in wildlife, with plains game and predators as well as Hippo and Crocodile in parts of the river.